The horse-collar tackle is an American football maneuver in which a defender tackles another player by grabbing the back-inside of an opponent's shoulder pads and pulling the ball carrier directly downward in order to pull his feet from underneath him. The technique is most closely associated with Pro Bowl safety Roy Williams. This kind of tackle was banned from the NFL during the 2005 off-season. The rule forbidding it is often referred to in the press as "The Roy Williams Rule". 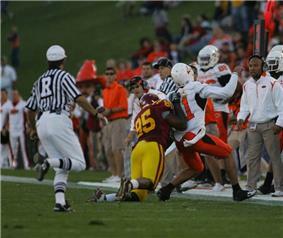 The rule, with modifications, was adopted in college football in 2008 and high school football in 2009. In the NFL, the horse-collar tackle results in a 15-yard personal foul penalty and an automatic first down if committed by the defense (penalty also will be enforced even if the opposing offense gains yards). It will often also result in a league-imposed fine on the player. Roy Williams was the first player suspended for repeated violations of the rule. The one-game suspension was given following a horse-collar tackle on Philadelphia Eagles quarterback Donovan McNabb that occurred on December 16, 2007, and it was Williams' third violation of the rule of the 2007 season. ^ a b Eric O'Keefe (2005-05-27). "Roy Williams Will Play by Rules, Including His Own". ^ John Clayton (2006-03-30). "NFL votes to rein in TD celebrations". ^ "CFL Announces 2007 Rules Changes".